For the first time in 48 years, Coventry City will kick off at 3:00pm on a Saturday in the third tier of English football, and first up it’s a trip to Huish Park, to take on Gary Johnson’s Yeovil Town. Yeovil, for several years were the perennial giant-killers in the cup competitions and under the guidance of Gary Johnson they sealed promotion to the Football League in 2003 and promotion to the third tier just two years later. However when Johnson left the Town hotseat and departed for Bristol City, just months after rejecting a move to the Ricoh Arena, the target seemed to change for the Somerset club as they fought for their League One lives yearly. Steve Thompson, Russell Slade and former player Terry Skiverton took the reins to keep the Glovers in the third tier, but in January this year Gary Johnson returned to Huish Park after a spell at Northampton Town; in the drop zone when he returned, Johnson steered the team to safety and 17th place. This summer the squad has got, similarly to Coventry, a lot younger. Reuben Reid, Marek Stech & Keanu Marsh-Brown are all in the formative years of their careers. Town boss Johnson has also added experienced striker James Hayter, from Doncaster Rovers to their ranks and he will be looking to get off to a good start in his first league start. The Glovers had a impressive pre-season campaign which saw them go unbeaten throughout and they continued their promising start with a comprehensive 3-0 win over League One rivals Colchester United in the Capital One Cup on Tuesday night thanks to a brace from central defender Richard Hinds and a goal from Marsh-Brown. Off the back of that and looking to upset one of the relegated teams, Yeovil present a tough task this weekend. Yeovil boss Gary Johnson hopes to welcome Rohan Ince and Gavin Williams back into his side on the opening day of the season. Chelsea loanee Ince has been struggling with a shin injury while Williams missed their midweek League Cup victory over Colchester with a calf injury. Both players face a late fitness test and Johnson was forced to name only five substitutes out of a possible seven on Tuesday night. Midfielder Keanu Marsh-Brown is pushing for a starting place after scoring from the bench in an impressive display. Gozie Ugwu or Sam Foley are the likely options to drop out. Defender James McAllister, who returned to the club in the summer, is expected to be appointed captain for the season after being handed the armband for most of pre-season and for Tuesday night’s win. Coventry City will be supported by nearly 2,000 fans for their first match in the third tier of English football for 48 years and manager Andy Thorn will be hoping to be able to call upon summer signings Steve Jennings, who was signed on Thursday as well as both John Fleck [Rangers] and Adam Barton [Preston] after they missed the 1-0 Capital One Cup victory at Dagenham & Redbridge on Tuesday night. Barton was away on international duty with Northern Ireland U21s despite only recently recovering from a broken leg and dislocated ankle, whilst Fleck was not risked after picking up a hamstring knock at the end of pre-season. Cyrus Christie (knee), Conor Thomas (ankle) and David Bell (hip) continue to miss out. Michael McIndoe: Winger Michael McIdoe signed for Yeovil Town for £25,000 in 2001 from Hereford United, before going on to make 91 appearances, scoring 22 times as Town gained promotion from the Conference as Champions in 2003. McIndoe then joined Doncaster Rovers for £50,000 as Town doubled their money. Following further spells at Derby County, Barnsley, Bristol City and Wolverhampton Wanderers, McIndoe found himself at The Ricoh Arena in August 2009 making 41 appearances, scoring once, before being loaned to MK Dons and eventually being released. McIndoe has since retired. Martin Cranie: Former City defender, who left the club following the expiration of his contract at the end of last season, the former England U21 international spent two loan spells at Town whilst on the books of Southampton, making a total of 12 appearances. Cranie made 114 appearances for the Sky Blues, scoring his only professional goal in a 3-2 home win over Sheffield United. Leon Best: Leon Best, like Martin Cranie, had a loan spell with Yeovil whilst on the books of Southampton. In 15 appearances, Best scored 10 goals for Town. With City he managed 19 goals in 92 appearances before being sold to Newcastle United. Adam Virgo: Defender Virgo made 15 appearances, finding the net once in a loan spell with Coventry from Celtic in 2006 under Micky Adams before a knee injury cut short his spell at The Ricoh. Following his release from Celtic he made a return to first club Brighton before finding himself at Yeovil making 33 appearances, scoring 5 times. Town was into the Second Round of the Capital One Cup with a comprehensive victory over League One rivals Colchester United. Two goals from defender Richard Hinds and a goal from substitute Keanu Marsh-Brown put Town in total control. City needed a last-minute penalty from captain Kevin Kilbane to overcome League Two opposition Dagenham & Redbridge on Tuesday night to progress to the Second Round where they have been rewarded with a home tie against Championship side, and local rivals, Birmingham City. Yeovil Town (4-3-3): Stech; Ayling, McAllister, Hinds, Webster; Blizzard, Upson, Foley; Hayter, Reid, Ugwu. Coventry City (4-4-2): Murphy; Clarke, Brown, Wood, Hussey; Jennings, Kilbane, McSheffrey, Fleck; Ball, McDonald. This is the first ever competitive meeting between the two sides and for the second time in a week City find themselves facing new opposition, following their victory over Dagenham & Redbridge in the Capital One Cup on Tuesday night, however City did defeat Town 3-0 in a friendly at Huish Park back in 1990. The currently appointed referee for Coventry City’s League One game at Yeovil Town is Dave Phillips from West Sussex. A police officer from Chichester, his only City game was the 3-0 defeat at Millwall last season. On Tuesday night, he was in charge of Northampton’s 2-1 win over Cardiff City. 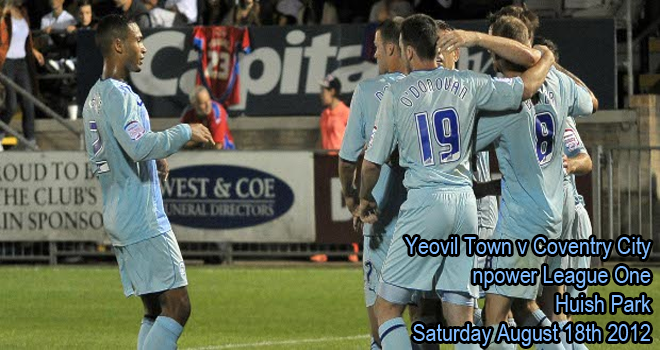 He last refereed at Yeovil on Saturday October 1st 2011 in a 3-1 loss to Bury.